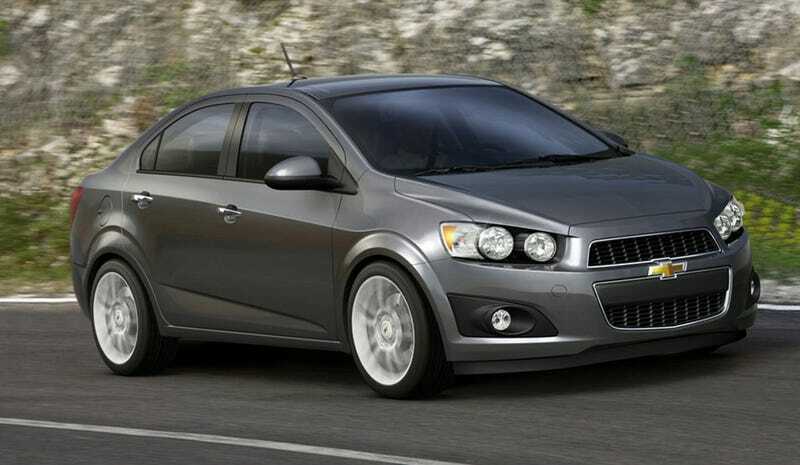 These first images of the 2012 Chevy Aveo show an econobox inspired by the angry Aveo RS concept and designed to make people forget how crappy previous generations of Aveos have been. A photo of the surprisingly attractive interior below. The 2012 Aveo sedan maintains the same Chevy family big-mouthed grille we lauded on the RS concept, albeit with less blue-tinted headlights. It'll still be based on a Daewoo platform when it goes into production in 2011 for a 2012 release in the U.S., but it's being promoted as a competitor to the new 2011 Ford Fiesta. But will it have the ability to beat the Fiesta in its status as top-of-the-shitbox driving enjoyment? We'll have to wait and see. The interior looks better than the current knock-off Rubbermaid-esque offering, with a two-tone dash, the new integrated control panel and, most intriguingly, a large tach with a digital information center. Remember, it's gotta be better because it could hardly be worse.